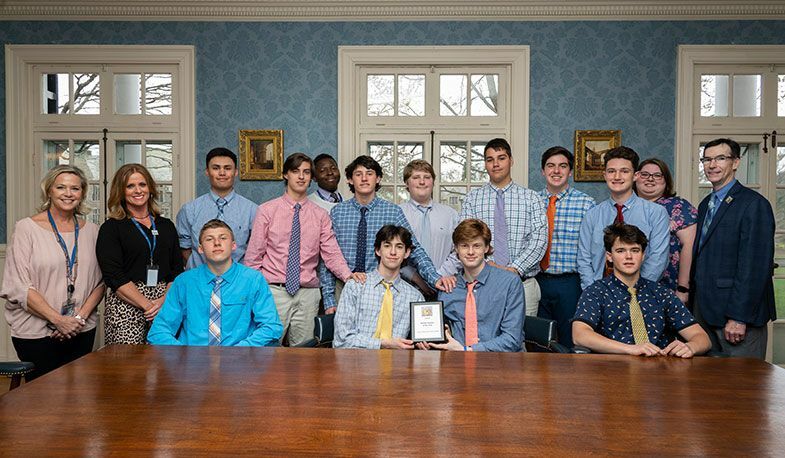 Our Best Buddies Chapter recently received the Rookie of the Year Award from Best Buddies Maryland for their advocacy and their partnership with the Forbush School At Hunt Valley. Tom Waite, Director of Programs and Operations, and Sarah Denhardt, Program Manager for Community Engagement, presented the award to our students last Thursday. Founded in the fall, our chapter has already hosted a school-wide campaign to encourage students to pledge not to use insensitive language. They have also hosted an awareness assembly, held two chapter fundraising events, and are planning a Field Day where they will welcome several other Maryland chapters for fun and games. Lastly, our chapter is registered for the Best Buddies Friendship Walk on May 4 and has already raised more than $700 which will go towards supporting integrated employment opportunities, leadership development, and inclusive living for members of Best Buddies Maryland. Learn more here. Big thanks to Pru Tucker, P '17, 24, for getting this initiative up and running at Loyola.